Will Coalition Politics Remain Important with a BJP Majority? Prior to 2014, India witnessed seven consecutive elections (1989 to 2009) in which no single party won a majority of seats in the Lok Sabha, resulting in minority governments, including unwieldy minority coalitions, dependent on external support (Sridharan, 2012, for details). With the Bharatiya Janata Party (BJP) winning a majority in the 2014 election, and continuing the trend by seizing two states, Maharashtra and Haryana from the Congress in the October 2014 assembly elections, the question arises as to whether coalition politics is still important. To our mind, the answer is an unambiguous yes; pre-electoral coalitions were important for the BJP’s majority in the Lok Sabha, a post-electoral coalition is necessary in Maharashtra, and alliance-building will be for the future in terms of passing legislation and expanding the party’s reach. In contemporary Indian politics, the incentive for national parties to form pre-electoral coalitions are straightforward. Given India’s first-past-the-post electoral system, the aggregation of votes at the constituency level is vital for winning seats. By implication, given the breakdown of the national party system into distinct state party systems, the formation of alliances with parties commanding a significant state-level vote share helps to aggregate constituency-level vote shares in states where one’s own party is not strong enough to go it alone. Hence, pre-electoral coalitions have the potential of increasing the number of seats won although they come at the expense of conceding a certain number of seats to allies, and also including such allies in a post-election government. The BJP, since 1989, has grown partly on the basis of its own ideological appeal and mobilization and partly by leveraging coalitions (Sridharan, 2005), while the Congress turned to coalitions with success in 2004 and 2009. 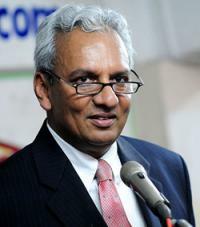 (Sridharan, 2004). The general finding on pre-electoral coalitions is that the seat-sharing ratio between partners tends to get stuck in a narrow band, and does not adjust smoothly according to the demands of a partner who perceives its popularity to be on the upswing. For example, both the Congress-NCP and BJP-Shiv Sena coalitions in Maharashtra, the BJP-Janata Dal (United) (JD(U))coalition in Bihar (until recently) and the BJP-Akali Dal coalition in Punjab, as well as the Left Front coalitions in West Bengal and Kerala, and the Congress-led UDF coalition in Kerala, all tended to remain stable in their seat-sharing ratios over the past two or more elections, with adjustments happening within a very narrow band (Sridharan, 2014, last chapter for details). It is only when old coalitions break down due to one partner demanding a substantial revision of terms, as in Maharashtra in October 2014 for both Congress-NCP and BJP-Shiv Sena coalitions, and new coalitions are formed that new ratios can be established. In 2014, the BJP struck a range of new alliances, most of them on more favourable terms than in the past while retaining its key old alliances (Shiv Sena, Akali Dal) on status quo terms. 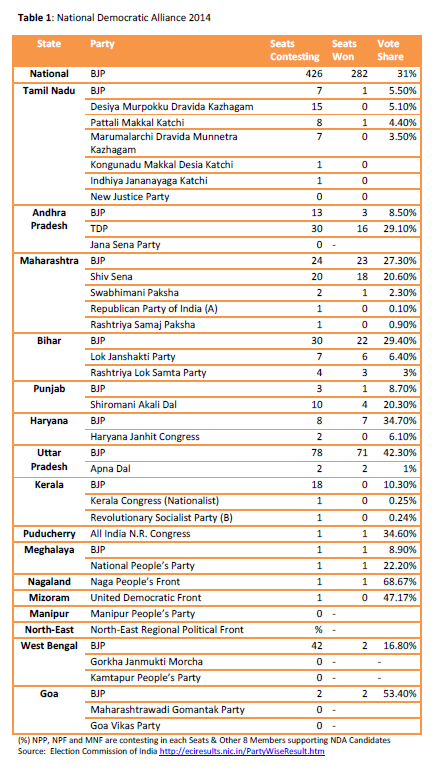 Thus, in 2014 the BJP forged pre-electoral alliances in 10 states (Table 1) compared to 6 alliances in 2009 in which both it and its partner(s) contested seats, of which 7 were new alliances – Bihar, erstwhile Andhra Pradesh, Tamil Nadu, Haryana, Kerala, Meghalaya and UP – and defined by more favourable terms. While the BJP has won 282 seats, a majority of the 543 elected in the Lok Sabha, it has formed a surplus majority NDA government with its pre-electoral coalition partners, taking the tally up to 334 seats. However, the question arises as to the stability of the BJP’s majority is in future elections and, by extension, the continuing relevance of coalitions. Of the 282 seats won by the BJP, as many as 57 seats are accounted for by states in which the BJP depended significantly on coalition partners (not counting UP where the Apna Dal was a minor ally). These are Maharashtra (23 seats), Bihar (22), Haryana (7), Andhra Pradesh (2), Punjab (2), Tamil Nadu (1 ). Now, even if we assume that two-thirds of these 57 seats would have been won by the BJP contesting alone, this would still leave it 19 seats short of its present total and short of a majority. Hence, the BJP’s majority in 2014 was crucially dependent on vote transfer from its pre-electoral allies, much like the CPI(M)’s majority in the West Bengal assembly in the past depended importantly on vote transfer from other Left Front allies. Leaving aside the importance of pre-electoral coalitions, the centrality of coalition politics will remain due to the NDA’s dependence on opposition parties beyond the coalition to pass legislation in the Rajya Sabha. At present, the BJP has only 43 members in the 245-seat Rajya Sabha, and just 57 with its NDA allies, well short of the halfway mark of 123. Even if one makes highly favourable assumptions for the BJP in forthcoming state assembly elections through its term, including the October 2014 elections in Maharashtra and Haryana that the BJP won, and factors in upcoming Rajya Sabha vacancies, the NDA’s net gains would still make it fall short of the halfway mark for most, if not all, of its term in office. Last but not least, coalition politics will remain important because the BJP’s stated objective is to expand its base outward from its current strongholds in the northern and central Hindi-belt states and the three western states. For this it will need allies in the other southern and eastern states except possibly in Karnataka and Assam. This is because the BJP’s narrow majority of 52% of Lok Sabha seats is very disproportionately based on an unprecedented sweep in the Hindi-speaking northern and central states and Union Territories and three western states and Union Territories. Of the BJP’s 282 seats, as many as 244, or 87%, came from this Hindi-belt plus western India stronghold, or in other words, it won a whopping 81% of the 304 seats in this region, or an even more whopping 92% of the seats contested (244 out of 266 contested) in this region based on a 44% vote share in this region. Replicating such a strike rate in future elections would be highly improbable. The BJP itself is aware of this fact, hence its realization that an expansion into the south and east will be necessary and will require either an improbable quantum jump in vote share, or more realistically, the formation of pre-electoral coalitions with regional party allies. For these interlocking reasons coalition politics will remain important for governance and for the BJP’s electoral strategy over its term, at the Centre and in the states. BJP President Amit Shah’s recent statement in the aftermath of the heady victories in Maharashtra and Haryana that the era of coalition politics is over looks like an overstatement for the three reasons outlined in this article over the longer term. SRIDHARAN, E. (2012), “Why are Multi-party Minority Governments Viable in India? Theory and Comparison”, Commonwealth and Comparative Politics, Vol. 50, No. 3, 2012, pp. 314-343. SRIDHARAN, E. (2005) “Coalition Strategies and the BJP’s Expansion, 1989-2004”, Commonwealth and Comparative Politics, Vol. 43, No. 2, July, pp. 194-221. SRIDHARAN, E. (2004) “Electoral Coalitions in the 2004 General Elections: Theory and Evidence”, Economic and Political Weekly, Vol. XXXIX, No. 51, December 18-24, pp. 5418-5425. SRIDHARAN, E. (Ed) (2014) Coalition Politics in India: Selected Issues at the Centre and the States, New Delhi: Academic Foundation. Categories: Uncategorized | Tags: BJP, Coalitions | Permalink. The 2014 General Election generated India’s highest ever voter turnout rate, at 66%, a sharp increase from the 58% turnout in 2009. However, many questions remain about the precise relationship between turnout and the outcome of the election. In these elections, the BJP won 282 out of 543 contestable seats on just 31% of the vote share. 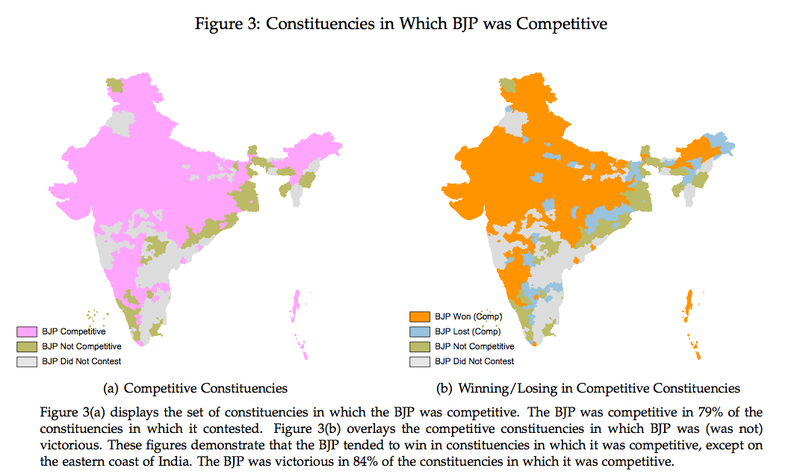 In my last piece, I showed how this outcome was a function of BJP’s strike rate in head-to-head contests against Congress (and against embattled regional parties in two states, Bihar and UP), which demonstrated BJP’s ability to project a convincing national vision (unlike Congress). At the same time, there was extreme regional polarization in BJP’s support, which pointed to the limits of BJP’s message in states with strong regional parties and identities. A deeper analysis of the voter turnout in these elections provides more evidence for these arguments, while clarifying the relationship between voter turnout and BJP support and shedding light on BJP’s prospects for holding on to power in the future. The dominant narrative in this election was that of a “Modi Wave,” which referred to then prime ministerial candidate Narendra Modi’s ability to bring new (or passive) voters to the polls and create a swell of support for the BJP. In order to test this narrative, I have analyzed the change in the voter turnout rate between 2009 and 2014 across parliamentary constituencies and the likelihood of BJP winning in a constituency in which it was contesting the election. The data provides strong evidence for the Modi Wave narrative, showing a clear relationship between an increase in voter turnout and support for the BJP. In the 116 constituencies in which the BJP contested the election where the increase in the turnout rate was less than 5 percent (to include constituencies where turnout stagnated or declined since 2009), it won only 24 percent of the time. By contrast, in the 312 constituencies in which the BJP contested and the turnout increase was more than 5 percent, the BJP won 81 percent of the time. For the more statistically inclined, figure 1(b) displays a flexible empirical model demonstrating the relationship between differences in turnout and the likelihood of BJP victory. According to the model, the BJP crosses the threshold of an even chance of the winning the constituency at approximately a 5.3 percent increase in voter turnout. As the increase in turnout moves towards 20 to 25 percent, a BJP win becomes almost a certainty. The relationship between increasing turnout and BJP support does not necessarily imply that new voters supported the BJP more than existing voters, but it seems likely that new voters were disproportionately supporters of the BJP. The post-poll survey conducted by Lokniti/CSDS provides some suggestive evidence on this front. Newly enfranchised young voters, aged 18 to 22, supported the BJP over Congress 39 percent to 19 percent. By contrast, those over the age of 56, more likely to be seasoned voters, supported the BJP over Congress 31 percent to 23 percent. In fact, it may very well have been the energy generated in mobilizing new BJP supporters that engendered large shifts in the existing electorate. While this analysis tells us that when new voters were mobilized the BJP tended to win, it does not tell us the extent to which voters explicitly showed up for the BJP. In other words, did voters specifically show up for the BJP, and, if so, when? In this analysis, as in the previous piece, a party was said to be competitive if it was one of the top two vote getters in a constituency. I also showed that in head-to-head contests between the BJP and Congress, where the BJP and Congress were the top two vote getters, the BJP had a spectacular strike rate of 88 percent. The data show that voters were not particularly mobilized when the BJP was not contesting or, indeed, competitive. In the 115 constituencies in which BJP did not contest election, the average increase in voter turnout was 4.3 percent, and in the 92 constituencies in which the BJP was not competitive, the average increase in vote turnout was just 2.1 percent. However, when the BJP was competitive, especially in head-to-head contests with Congress, voters were extremely mobilized. In the 189 constituencies in which the BJP went head-to-head against Congress, the average increase in voter turnout was an astonishing 11.4 percent. Even in the 147 constituencies in which the BJP was competitive against other (non-Congress) parties, the average increase in voter turnout was 9.7 percent. Much like the vote share for the BJP, the change in voter turnout displays significant regional variation at the constituency level. 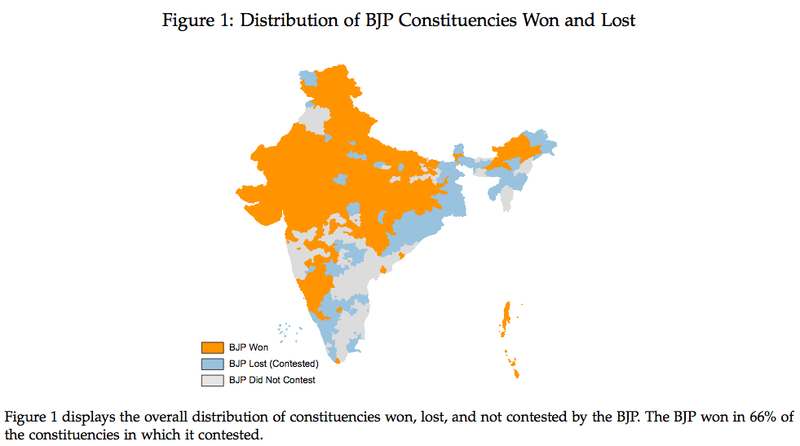 As the analysis above suggests, changes in turnout closely track constituencies in which the BJP won. Figure 3 displays, side-by-side, a heat map of increases in voter turnout and a map of where the BJP won. Historically, the variation in voter turnout in Indian general elections has been driven by differences at the state level. One of the major stories of this election is the narrowing of differences in turnout between “high” and “low” turnout states. Of the 15 most populous states in India, 4 states had a turnout rate less than 50 percent in 2009, with Bihar the lowest at only 44 percent. In 2014, turnout rates of the low turnout states increased significantly; the lowest turnout rate of these 15 states was 56 percent (Bihar again). At the same time, most of the high turnout states did not register significantly greater turnout rates in 2014, suggesting little room for additional mobilization in these states. In the previous piece, I identified six states in which the BJP did particularly well, Bihar, Gujarat, Madhya Pradesh, Maharashtra, Rajasthan, and Uttar Pradesh. In these states, the BJP had a strike rate of 91 percent and won 69 percent of their total seats. Figure 4 demonstrates that these six states are among the lowest turnout states, in both 2009 and 2014, out of the 15 most populous states in India. Starting from a low base, these states provided a natural reservoir for the BJP to bring in new voters. I also demonstrated that the BJP did particularly poorly in five states, Andhra Pradesh, Kerala, Odisha, Tamil Nadu, and West Bengal, with a strike rate of just 7 percent. These 5 states are among the 6 highest turnout states in figure 4. With the exception of Odisha, they also display small changes in voter turnout. With populations already mobilized through strong regional parties, and little existing electoral base, the BJP had little scope to mobilize a large share of new voters in these states. These data demonstrate that there was, in fact, a Modi Wave; the success of the BJP was closely tied to mobilizing new voters. When many new voters were mobilized, the BJP was very likely to win the constituency. Voters also specifically came out to vote in constituencies where the BJP was competitive, and more so in constituencies in which the BJP was engaged in head-to-head battles with Congress. The data also show that the states in which the BJP has performed poorly are precisely the states with very high turnout. This means that if the BJP is to consolidate power in these states, it will have to do so without mobilizing new voters but converting existing ones. In other words, in addition to dealing with a weak electoral base, the BJP will have to change the minds of voters who may already be mobilized through strong regional parties. In this election, the BJP projected a national vision of restoring economic growth and macroeconomic stability to India. The scale of voter mobilization suggests that the BJP was offering a national vision that especially appealed to previously apathetic voters. Voter apathy results from believing that all of the existing choices offer little scope for political or economic change. The BJP presented a different option, but if it wants to consolidate power it will have to deliver on its mandate. The BJP’s particular ability to mobilize voters against Congress only underscores the popular frustration with Congress’ handling of the economy. Modi will have to disregard the many countervailing pressures being placed on him and act decisively on his “economy-first” mandate. Previously apathetic voters are more likely to become apathetic again, and the BJP is unlikely to extend its base too much regionally. If Modi wants to hold on to the voters he mobilized, he will have to demonstrate that he can stay away from political appeasement and focus on righting the economy. The upcoming budget is his first test. 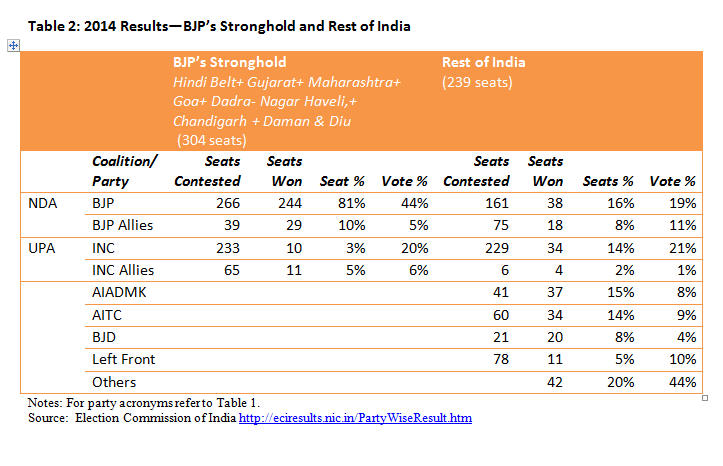 Categories: Post-election analysis | Tags: BJP, Congress Party, Lok Sabha Election 2014, Regionalism, voter turnout | Permalink. This article also appears on India in Transition. At the outset it should be clear that in a multi-party first past the post system discrepancies between vote shares and seat shares are the norm, not the exception. In the last UP Assembly election, the SP won 224 seats with 29 percent of the vote while the BSP won just 80 seats with 26 percent of the vote. A closer look at the election numbers not only explains the BJP’s ability to convert vote percentage into winning seats, it also sheds light on attitudes in the Indian electorate. Outside of head-to-head battles with Congress, and outside of Bihar and Uttar Pradesh (where the strike rate was 86 percent), the BJP contested 144 constituencies, but was competitive in only 56 of them. Even when it was competitive, the BJP had a lower strike rate of 63 percent. In short, the numbers demonstrate that the success of the BJP in this election was due to its spectacular strike rate against Congress and its remarkable performance in Bihar and Uttar Pradesh. These two categories account for 247 of the 282 BJP seats won in this election. To understand this point, consider the state of West Bengal, a state where the BJP received its highest ever vote share at 17 percent. The BJP contested all 42 constituencies and won just 2 seats (one of which it had also won in 2009). It was competitive in just 3 other constituencies. Not only did the BJP fail to convert its vote share into seats, it wasn’t even close. Nonetheless, given the weakening of CPM in West Bengal, the BJP may emerge as the main opposition to the ruling TMC in the future. Similar patterns were seen in many states with strong regional identities. The BJP won just 3 of the 12 seats it contested in Andhra Pradesh, 1 of the 8 seats it contested in Tamil Nadu, 1 of the 21 seats it contested in Odisha, and none of the 18 seats it contested in Kerala. These five major states yielded a strike rate of just 7 percent for the BJP. The BJP emerged as the only party with a persuasive national vision in this election, but, as its vote share reveals, this does not mean it is representative of all of India. Apart from the apprehensions of India’s Muslim community, the data show that significant swaths of India were relatively unaffected by the “Modi Wave.” One of the new government’s challenges will be to address the obstacles generated by this regional polarization. Much will depend on the personal equations that the Prime Minister establishes with the regional leaderships. This will likely be relatively easier with Tamil Nadu, somewhat less with Odisha, and perhaps most difficult with West Bengal. Notes: On its website, the ECI reports 428 candidates for the BJP; I count 427. The results should not be materially affected. In an earlier version, I reported the strike rate in Bihar and UP at 85%; it is 86%. I have included the seat given to S. Gurumurthy by the BJP in the calculations, even though his nomination was rejected. Again, this does not materially affect the results. I wish to thank Milan Vaishnav for providing me with elections data in a usable form. On editing, I want to thank Devesh Kapur and Milan Vaishnav for making sense of what I wanted to say, and then making it make sense to you, the reader. All opinions and calculation errors are my own. 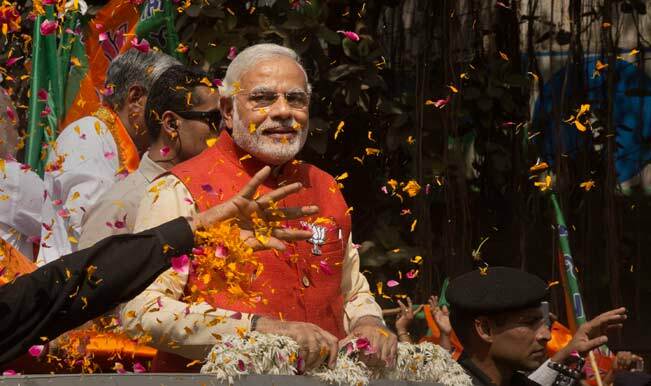 Categories: India in Transition articles | Tags: BJP, Lok Sabha Election 2014 | Permalink. The votes are in. In a historic vote for change, the BJP has become the first non-Congress party to achieve an outright majority in the Indian parliament. Devesh Kapur, Director of CASI, discussed the election results with Bobby Ghosh, TIME World editor; Vani Tripathi, national secretary for the BJP; Frank Wisner, former US Ambassador to India; and Marshall Bouton of the Asia Society Policy Institute at an event hosted by the Asia Society in New York on May 19th. Watch the full video here (1 hour, 25 mins). Find coverage of the event in this Business Line article. Read further election analysis from Milan Vaishnav, Associate at the Carnegie Endowment and research affiliate on the CASI Lok project: India’s Congress party: Down but not out, BJP landslide shatters 4 electoral myths, ‘Quick economic turnaround’ expected of Modi, and A Devil Called Policy Paralysis. Watch the Asia Society event video here. Categories: Uncategorized | Tags: BJP, foreign policy, Lok Sabha Election 2014, Narendra Modi | Permalink. CASI has been delighted to host Former Indian Ambassador Jayant Prasad as a Visiting Scholar this spring. Read Mr. Prasad’s recent article in The Hindu, “For a clear nuclear doctrine”, on India’s nuclear policy and how it has transformed over the years. “For India, nuclear deterrence is defensive and a means to secure its sovereignty and security. Its strategy of assured retaliation, combined with “no first use,” provides adequate guarantee for this purpose. The strategy was unveiled concurrently with its 1998 nuclear tests, which ended the determined U.S. bid to prevent India from acquiring nuclear deterrent. Ironically, India’s nuclear weapons tests, together with the rapid expansion of its economy, transformed its global outlook and relations with the U.S. and the world.” Continue reading..
Will the next government in New Delhi have new answers to old foreign policy challenges? Prasad joined C. Raja Mohan, and Ashley J. Tellis last week in a discussion on this important question. The discussion, posted below, took place at an April 28th event hosted by the Carnegie Endowment for International Peace in conjunction with the Indian Council of Cultural Relations on the future of India’s foreign policy after the election. Categories: Uncategorized | Tags: BJP, foreign policy, nuclear weapons, Pakistan | Permalink. 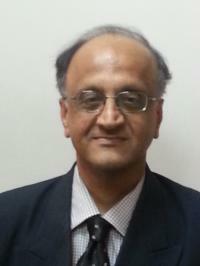 Dr. E. Sridharan, the Academic Director of CASI’s New Delhi branch, the University of Pennsylvania Institute for the Advanced Study of India (UPIASI), has written a post on pre-electoral coalitions for the University of Nottingham’s School of Politics and International Relation’s blog Ballots and Bullets. Read his insightful analysis of the politics of coalition formation before the election. Categories: Uncategorized | Tags: BJP, Coalitions, Congress Party | Permalink. The Economist has dedicated significant coverage in their April 5th issue (including their cover) to the Indian elections. Check out their briefing on the youth vote in India which features data from the Lok Surveys. They argue that India’s political climate is undergoing dramatic shifts due to changes in the electorate (more young people and female voters), rapid urbanization, and rising incomes. The article also discusses the cult of personality around Narendra Modi and the voter’s prioritization of economic growth. Vaishnav and Swanson’s graph, highlighted in the issue, shows how voters today, more than in the 1990’s, are making their decisions on whether to re-elect incumbents based on the economic growth over their term. Categories: Lok Surveys, Pre-election survey | Tags: BJP, Economics, Gender, Lok Sabha Election 2014, Narendra Modi, Youth Vote | Permalink.